It can be scary if a bat starts flying around your house. But never fear: help is here! And remember: the bat is WAY MORE scared than you are and definitely wants out too! In the above video, Bat Conservation International shows you exactly how to safely and humanely remove unwanted bats, and offers tips on how to keep them from coming back. 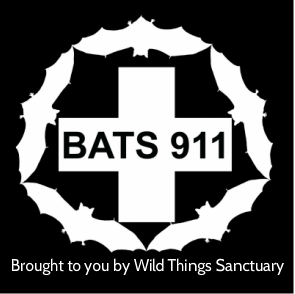 Bat World also has a great page with tips for what to do if you find a bat. Remain calm, remember the bat doesn't want to hurt you: it's terrified and wants out! Don't take your eyes off the bat. People mistakenly hide and then they don't know if the bat is still inside or if it left. Remember again, the bat doesn't want to hurt you: it's terrified and wants out! If it flies into a room, shut that door so the bat is in a smaller area, and then open doors and windows in that room. Don't take your eyes off the bat to make sure you see it exit. If the bat lands or if you find it hanging (they often sleep that way during the day, often in places like drapes), you can carefully catch it like you would a spider by placing a container over the top and sliding something underneath. Be careful of the delicate toes! Or you can carefully lift off with a towel, and bring outside. Wear gloves! If it is winter it may be too cold, so call a wildlife rehabilitator and ask for advice and whether they can overwinter it. If you carry it outside, best to watch it fly off to make sure it can fly. Otherwise, place up high on a tree, so it can be safe. Remaining calm will be a big help to you and the bat. If a bat is flying around that is a great indication that it is healthy. I've never had a rabid bat in care that was able to fly.